Gosh it is Wednesday again, nearly Easter and I haven't recovered from Christmas yet. Welcome to all you lovely people who drop in to share my work space, for uninitiated this is the place where we bare all, well as far as our worktops are concerned, and share them so that you can see mine and I can see yours, just pop of to Julia's and you can follow the links to lots of bared worktops. Right so what is on my worktop today, or in reality, what was on my worktop at 5.30 Tuesday before the light failed. Well actually for a change, it is rather bare. 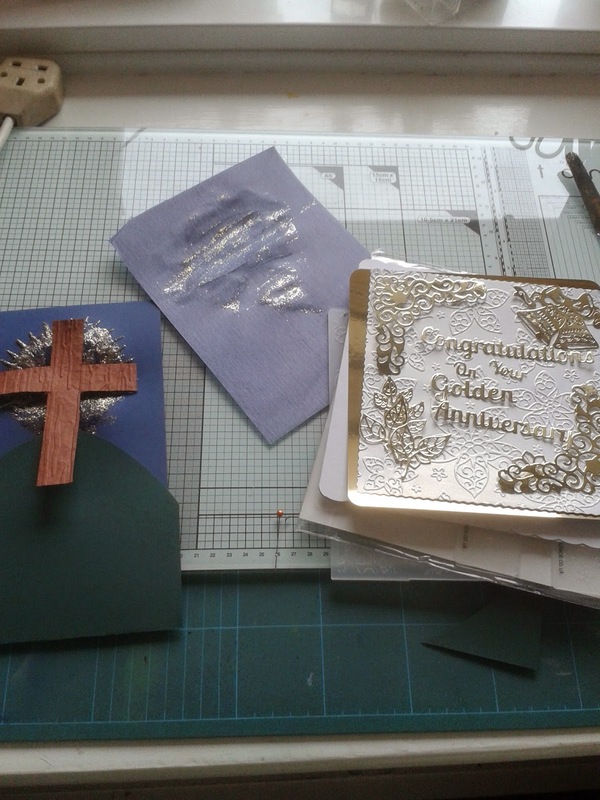 On the left is a Baptism card for friend who is being baptised, by full immersion, on Easter Sunday and on the right is the Golden Wedding card for my sister, who is celebrating 50 years of wedded bliss!! !, in July. And the scrappy bit of light blue card was the first attempt at a backing for the cross, destined for the bin, because was too generous with the glitter and made a mess. 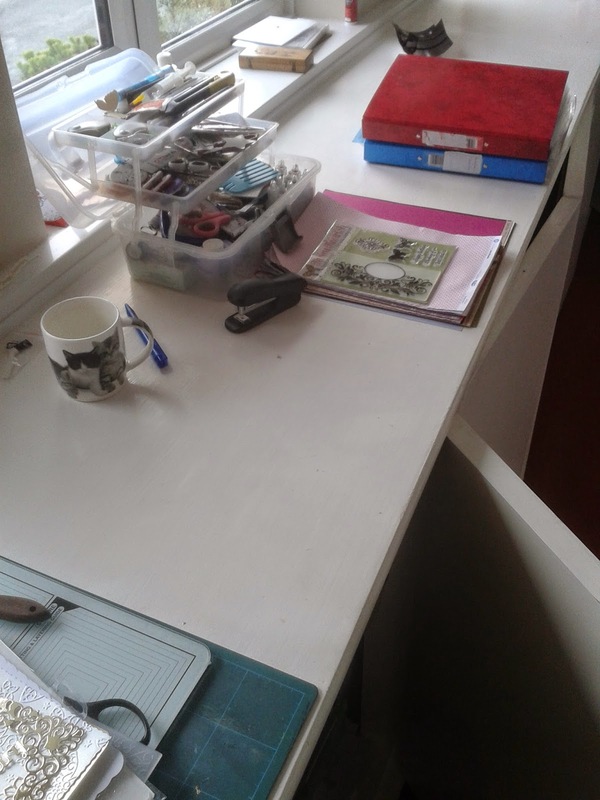 And a side view of the desk shows you that is is very clean and uncluttered, with just the two folders of my die cutters and some papers and a free embossing folder from a magazine. The reason it is so cleared is that we are off on our travels on our narrow boat, so I have had to clear the place as we have family who are planning on having free holidays in Wales, while we are away, and friends coming into check between family stays. I felt it really would be nice for my family not to have to wade through all the paper 'pooh' on the landing carpet. 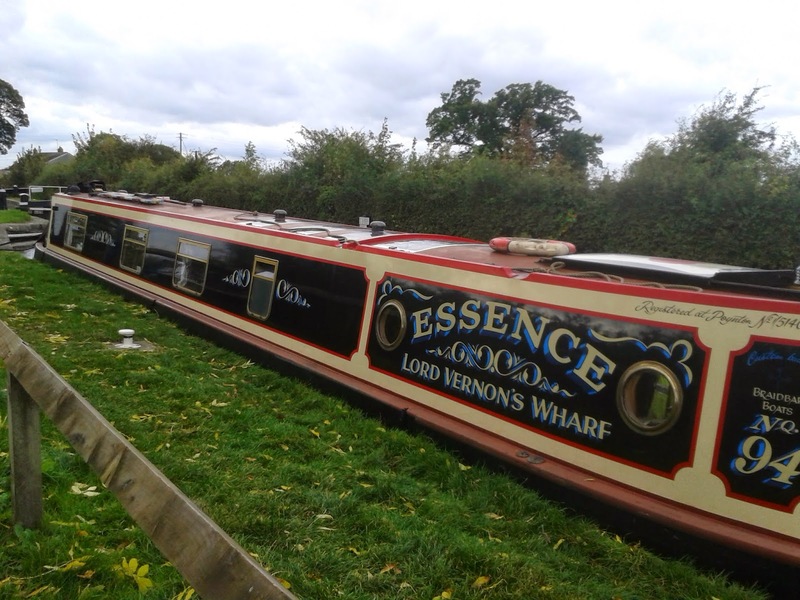 So this will be our home for the next three months and if anyone here live near the Trent and Mersey, Coventry, Oxford or Grand Union canals and see us gliding along, do make yourself known. Right now I really must go and make a pile of essentials and then reduce it too one crate full!. If you leave a comment, I promise I will return your kindness, but it may take me a couple of days. Weyhey Chris. Not long now. See you Saturday morning, for your life on the ocean waves - well, I hope there won't be TOO many waves - not on the canal, anyway. Oh how lovely to spend three months enjoying the pace of canal life. Enjoy every minute. Hope you find lots of crafty creative stores along your way. Wow, not just a week or two then, how wonderful. I see why taking craft stuff is necessary, and I see why it's difficult to work out what! Wow this sounds like such an adventure I want to come too and you are going to be travelling for 3 months what a way to go. I am sure you are going to have an adventure of a life time. Hope you have a wonderful Easter. This sounds wonderful and I hope very relaxing. We get loads of boats coming through Lincon, maybe you will be one of them? Enjoy your travels. Looking forward to seeing what you create in a smaller space. Ooo, a three month narrowboat trip - heavenly! Pity about the limited space for stash though. I hope you manage to decide what to take along. When I used to go to a scrapbooking club, some of the ladies would come in with boxes and boxes of stuff... I always took a couple of small 12" boxes, plus a tote with my tools, a few punches, inks etc. It was easier to travel light. Mind you, the club was only round the corner, so I could always slip home, if I'd forgotten something essential! Maybe I need to have a tidy up - your desk looks inviting, because it's clear enough to see what you have, whereas my workdesk is so messy... Definitely time for a tidy up! I'm very envious that you get to travel on a narrow boat. Our nearest stretch of canal is at Bradford -on-Avon. Have a wonderful time. Thanks for stopping by yesterday. My internet was not playing nice then so am catching up today. 3 months boat trip! How awesome! Have fun! Thanks for sharing. Congratulations on your friend's baptism, Chris, and what lovely cards you have made! Love the narrow boat too, and your extremely tidy desk. Thank you for your loving and prayerful comments during my hospital stay - I am very glad to be home (came back Tues.) and can't believe that exactly a fortnight ago I was in theatre! My recovery is going well and my hubby and I are adjusting to our new way of life with the stoma. I have so many lovely messages to reply to and it's going to take a while. Keep an eye on my blogs for further updates as and when I am able to do them.